I was given a sample of this kit in order to review it and tell you about it. All opinions are my own. I am a HUGE fan of doing sign language with babies. Oh the tantrums you can divert! I have talked about it in The Screaming Non-Verbal Baby/Toddler, Preventing Whining, Controlling the Young Temper, Language Development, and Sign Language. Sign language is powerful. So I am so excited to bring this giveaway to you today! 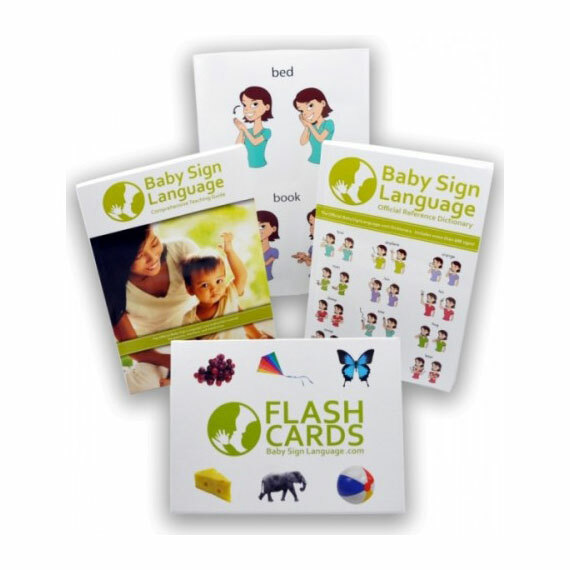 The people at BabySignLanguage.com have a variety of sign language kits to help you teach your babies sign language. The standard kit they are giving away today includes flash cards, a BSL guide book , a signing dictionary, and a wall chart. These items are very high quality. I love the guide book because it is over 100 pages long full of instruction on how to teach your baby sign language. It is very comprehensive and helpful! You will love this. It is great for you to have to yourself or to give as a gift. Also, I noticed that right now all of their kits are on sale: http://www.babysignlanguage.com/store/. Check their website and blog out. They are both full of information on teaching sign language. It is all very helpful! Entries will be accepted until 12:00 midnight October 3, 2014. I'm excited to learn how to use sign language to communicate with my baby girl! This is so great! Sign language is such a helpful tool! I would love to use this kit for my younger son! My daughter just learned "diaper," and her favorite sign is "fan." Love BSL! I am teaching my 1 year old basic signs such as 'more' 'all done' 'eat' 'drink' etc. I would LOVE this resource! I'm using baby sign language with my 5 month old. I became a fan when I saw babies in our church nursery using sign language to express their needs. I'd love to be able to communicate with my baby better. I uses the basic signs with my daughter. The ones we knew really helped. I have never used sign language, but would love to try it with my new little one! I took 3 semesters of asl in college and loved it! I have gotten to use it on occasion in my job as an ER nurse. I cannot wait to sign with my 11 week old son…I have already started signing while singing the alphabet and simple words…but I want more specific guidance as to how to tailor it to babies! I cannot wait! We are very excited to teach our son to sign! I'm a first time mom and have read your blog since before my son was here! He's 6 months now and we've started working on BSL, but could definitely use a great resource! Thank you so much! I have used some and my girl has started using them too!